Just when we thought things were getting interesting in the Middle East, just when we thought Brexit was going to happen/not happen – who knows any more – the Italians have come along and given us something else to talk about. On the 23rd of March they went ahead and did the unthinkable, at least in the eyes of Washington and the head honchos in Brussels – they became the first G7 country to join China’s Belt and Road Initiative. Washington is not happy. Macron is aghast, as are many in Brussels. Secretly, other European states are looking at it and going, “Why not?” The Germans and the French are probably jealous. I had forecast before that big challenges were coming for Europe, meaning the EU, and it was not just about Brexit. I, for one, think the EU will survive. But there will be very significant changes in its structure. Living here in Italy now there is more than a little interest in the China connection for me. Events like this will certainly shake things up in Brussels and in Washington, that is if De Maio and the present government can pull this off. Kudos. Of course, now there are all the dire warnings of the Chinese debt trap and so forth, scaremongering in other words. But when it comes to it, what do the Italians have to lose? Since Italy became a Eurozone member its economy has stagnated, investment has plummeted, infrastructure has decayed, its debt load is increasing, the banking system is in a terrible state and it has been prevented from doing anything about it by Brussels. That has now changed. China has come into the heart of Europe. Marco Polo would be proud. Mercury in this case is a mixed bag, either indicating with Neptune self-deception or a high ideal. It can be quite a hypnotizing combination. 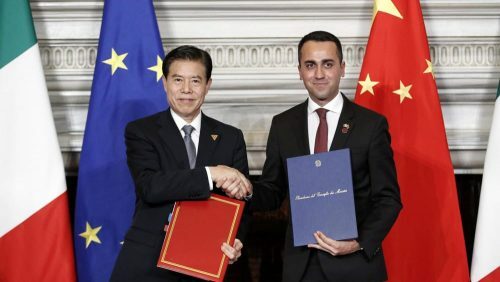 The self-deception is possible, but before we think the Italians (or the Chinese for that matter) might be fooling themselves about the deals, they may also be discounting the reactions and responses to come from their Western partners. And with Mercury retrograde at the time of the signing there may be problems in getting the initiative going. Those will work out over time. However, the Mercury/Neptune conjunction is sextile Saturn, giving a realistic view, stability and a clear view of the landscape. With Saturn, this is a combination that will aid markedly in manifesting the plans between those two ancient nations. The other 4th house ruler, Venus, is sextile Jupiter, and with Libra being intercepted may indicate hidden blessings in the deals. Venus also rules the 11th house (friends and the desires of the public). It is an aspect that lends support, and it adds to material benefit. It is one of the ‘money aspects’, and will contribute strongly to cultural exchanges. These are already on the cards. The three largest expat Chinese communities in Europe are in the UK, France and Italy, in that order. The monetary side is further aided by Jupiter being at the midpoint of Mars/Pluto, which is a particularly good indicator of success, and of an unusual order. But the big indicators for success are the Mars/Saturn trine, with Saturn right at home in Capricorn, conjunct Pluto, and with the latter also trine Mars. Mars in Taurus is a stubborn placement and will win out over opposition. This is a very tough combination, in a good way, and it builds wealth, with a long view to the future. It is a combination that indicates one taking one’s destiny into their own hands, and there is nothing shabby or flakey about those plans. 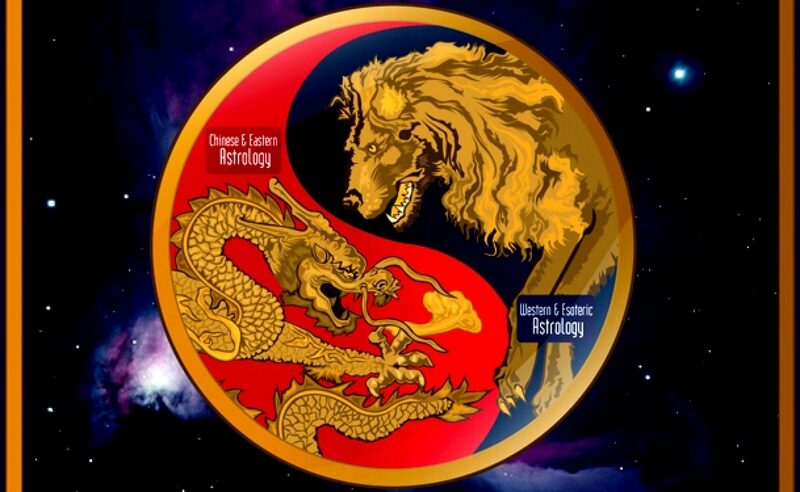 Mars co-rules the 10th house, the latter ruling so many things, but among them the national prestige, national affairs, the executive and national trade. Mars also rules the 5th house, discussed previously, and the combination points to a strong and constructive partnership. I wonder if they consulted Paolo Fox (translate) for the timing of this event? I say it jokingly with a nod to Italians, who will know him well. 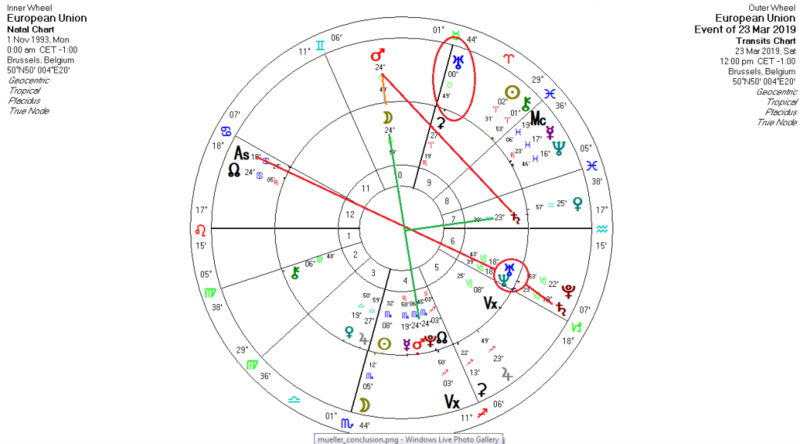 There is a ‘Pythagorean triangle’ in the chart (Venus/Mars/Jupiter), which indicates a changeable mix of factors. Pythagorean triangles are often indicated in the charts of comedians, or even of comedic circumstances. In fact, all but one of the comedians listed in the Ixion article had said triangle. In this case the quincunx, one of the indicators of humor, is between Mars and Jupiter, with Mars square to Venus. The square can often indicate troubles in relationships, or spice, depending on one’s outlook, and it is not difficult to see where the strained relations will be, involving the four houses Venus and Mars rule – the 4th (infrastructure and opposition parties – the latter being Washington and the EU in this case) and the 11th (the desires of the public and alliances) for Venus; the 10th (public affairs and the sitting government), and the 5th (ambassadors, schools and CEOs) for Mars. But Italians, being who they are, will no doubt enjoy the angst of the opposition and approach relations in a sense of good humor. Mars with Jupiter will also build bridges between parties in energetic and unexpected ways. Regarding telecommunications, Washington is currently doing battle with Huawei, which is reality is more economic in nature than it is about spying. There is more than a note of hypocrisy in the latter concern. The Huawei kerfuffle is really about the Trump administration wanting to move the 5G portfolio into the hands of Verizon and the Israeli start-up Armis instead of allowing the Chinese access into the network, which would sideline US interests. There are so many threads we could follow here, but we will stick with the EU for now. Three main points stand out: the transit of Saturn over the EU Uranus/Neptune conjunction, and the transits to the t-square in the EU chart with Saturn at the apex and the Moon opposite a Mars/Pluto conjunction in the base. Thirdly, we note that revolutionary Uranus has just come up to the Midheaven. Uranus will pass the MC for the last time exactly in mid-April, next month. That transit is a ‘coup indicator’, meaning changes at the top. It also tends to rile opposition parties. As to the first item mentioned, at the time of the signing, the Saturn=Uranus/Neptune transit signaled a loss, instability and/or pessimism. The Uranus/Neptune aspect by itself gives a sort of earthy idealism on the one hand and instability on the other. It is also a pioneering aspect, great for occultists and free-thinkers, but not so much for practical real-world matters, unless harnessed by other factors. The transit of Saturn over that point is bringing reality to the ideals behind the EU – freedom of movement, equality of states, single currency, democracy and so forth. All of those ideals are being brought into question. The ones that are valid will stand. The ones that are not will either change or cause the Union to collapse. Such is the work of Saturn. It brings the opportunity of change and of making better choices. 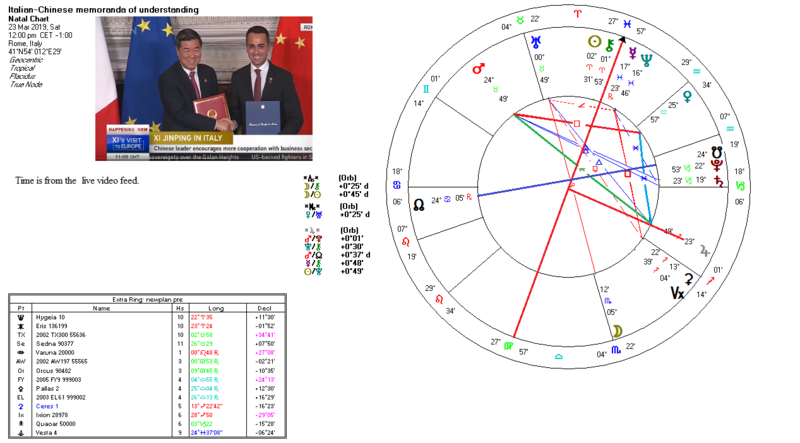 The transit of Mars at the time of the signing activated the t-square, which points to the inherent intransigence of the leadership, with the base of the t-square lying across the 4th/10th house axis. The apex Saturn is in the 7th house, constantly emphasizing the rule-of-law within the Union. That t-square also forms a midpoint axis, Saturn=Moon/Mars, which in reality can be a very powerful combination if given enough time and opportunity to develop. It speaks of learning deeply through experience, primarily because of early inhibitions and responsibilities and pushing through them. The EU has certainly gone through a steep learning curve. I have written more extensively on the EU so will not cover old ground here. But this is where we get to the crux of what is evolving for the EU in the next years, and it involves Uranus to a big degree. The transit of Uranus, especially in its revolutionary context, is showing three things currently: Brexit, the gilet jaunes in France and now the Italian connection. All of these are shaking the foundations of the EU. Of the three, the protests in France and the moves by the Italians will have more far-reaching outcomes for the EU, simply for the fact that the UK is not a Eurozone member. The Eurozone is fundamental to the functioning and structure of the EU, and that is now what is under threat. And it is under threat from three main factors: the Trump administration which sees the EU as a major competitor, the basic inequalities built into the system itself (the single currency was premature) and the control of the IMF and WTO, which are controlled by Washington and Wall Street. The EU is based in a neo-liberal, austerity-based culture which has transferred wealth from the common people to the wealthiest few percent, and that, in reality, is what is being challenged by the French protesters and the Chinese Belt and Road Initiative via the Italians. The Italians have started something that will now spread throughout Europe, starting in the Mediterranean rim and Eastern Europe and eventually to the remainder of the continent. If the British were to decide to stay in they could take advantage of what is coming. Macron, for all of his initial criticism of the Italians, has made a U-turn and, not to be outdone, has signed contracts with the Chinese to the tune of 30 billion euros. To put this in perspective, the initial deals made by the Italians total only 5 billion euros, but that is set to increase to 20 billion before too long. For all the warnings about the Italians entering into a debt trap, that is only so much nonsense. The Italian economy is over a trillion euros. A few billion euros is not going to break the bank. Yes, debt may rise for a few years, but once trade is going it will quickly come down. Most of the warnings about the Chines come out of Washington, who now see the Chinese as Enemy #1. And if we check the sources on the articles (like this one) warning of catastrophe, we often find that the people sounding alarms have connections with the IMF and so forth. The Italians have started something in Europe that will change Europe in fundamental ways. China coming into Europe will strain the Atlanticist alliances, like NATO and so forth. Europe needs to find its own destiny, free of the sort of overbearing influence the US has had over it since the last world war. France and Germany will no doubt come onto the Chinese project in some form or another at some point, despite the empty posturing of Macron ‘pushing back against China’. Money talks, and the French economy is in trouble, too, hence their protests. And all this means also that Russia will be making inroads into Europe. Russia and China are a very close team and Russia is an integral partner and pathway in the Belt and Road. Nordstream II is soon to be a reality, despite the objections of Washington. And we have not even gone into the directions for the EU here, but the stresses over the coming years are similar. It will face significant turning points next year, with the early years of the next decade seeing the main shifts. The event in Rome on the 23rd was symbolic, but it was also a seed, one that will no doubt sprout and grow. Good for Italy, looking forward to how this relationship with these two nations progress and the influence to the EU. Previous PostPrevious The verdict is in: It was divine intervention.